Warranty all (non-networking) products purchased from COOLER MASTER as free from defects in material and workmanship for normal use by the original purchaser for warranty period. COOLER MASTER is not responsible for damage to or loss of any programs, data, or removable storage media. You are responsible for backing up any programs or data on removable storage media. Except for the warranties set forth herein, COOLER MASTER disclaims all other warranties, expressed or implied or statutory, including but not limited to the implied warranties of merchantability or fitness for a particular purpose. Any implied warranties that may be imposed by applicable law are limited to the terms of this limited warranty. In no event shall COOLER MASTER be liable for any incidental, special or consequential damages, including but not limited to loss of business, profits, data or use, whether in an action in contract or tort or based on a warranty, arising out of or in connection with the use or performance of the product, even if COOLER MASTER has been advised of the possibility of such damages. You agree that repair, replacement or refund, as applicable, under the warranty services described herein is your sole and exclusive remedy with respect to any breach of the COOLER MASTER limited warranty set forth herein. if, despite the foregoing limitations, for any reason COOLER MASTER becomes liable to you for damages incurred by you in connection with this agreement, then, the liability of COOLER MASTER will be limited to the amount equal to the latest distributors price. Some states or provinces/jurisdictions do not allow the exclusion or limitation of incidental or consequential damages for consumer products, and some states or provinces/jurisdictions do not allow limitations on how long an implied warranty lasts. In such states or provinces/jurisdictions, the exclusions or limitations of this limited warranty may not apply to you. You may also have other rights that vary from state to state/jurisdiction to jurisdiction. You are advised to consult applicable state and provincial/local laws. All products from Cooler Master at least carry 1 year warranty from the date of purchase, with the exception of power supply units which carry a 2-5year warranty. If no proof of purchase can be presented upon request, Cooler Master cannot be held responsible for warranty service. The original customer purchasing the Cooler Master Product is covered under the Cooler Master Warranty Program. It is important to note that our warranty is not an unconditional guarantee for the duration of the Program. Any replaced parts become the property of Cooler Master. The Program does not apply to the software component of a product or a product which has been damaged due to accident, misuse, abuse, improper installation, usage not in accordance with product specifications and instructions, natural or personal disaster, or unauthorized alterations, repairs or modifications. Any product which has been modified without official permission from Cooler Master, or on which the serial number or warranty sticker has been defaced, modified, or removed. Accident, abuse, misuse, neglect, fire, water, lightning, or other acts of nature, commercial or industrial use, unauthorized product modification or failure to follow instructions included with the product. Third party products using Cooler Master Components will not be covered by warranty. See your vendor or the manufacturer for information about servicing. Repair or attempted repair by anyone not authorized by Cooler Master, Inc. Unauthorized repairs to a Cooler Master product will void the warranty offered by the Program. Cooler Master reserves the right to refuse to service any product which has been altered, modified or repaired by non- Cooler Master Service personnel. Cooler Master does not warrant that this product will meet your requirements. It is your responsibility to determine the suitability of this product for your purpose. You are responsible for the cost of shipping the product to Cooler Master. Cooler Master pays the cost of returning a product to you. Cooler Master reserves the right to replace the product with a service product at their sole discretion at any time. Product malfunction or damage resulting from liquids or moisture. All accessories that malfunction due to physical damage such as: USB cables, extension cables, adapter cables, adapters, power cords, screws, retention brackets, ear cups, and all other similar accessories. There are no other oral or written warranties, expressed or implied, including but not limited to those of merchantability or fitness for a particular purpose. The duration of implied warranties is limited to the warranty length specified in Paragraph one. If you need help installing or troubleshooting a product please submit a technical support request here. Cooler Master's sole obligation and liability under this Program is limited to the repair or replacement of a defective product at our option. Cooler Master shall not, in any event, be liable to the purchaser or any third party for any incidental or consequential damage, (including, but not limited to, damages resulting from interruption of service and loss of business), or liability in tort relating to this product or resulting from its use or possession. Global warranty is not currently available. If your product needs repair or defects within the first 30 days after purchase, please return it to the merchant from whom you purchased the product with and enclose a description of the problem and a copy of your proof of purchase with the defective product. All replacement products have an extended 30 days of warranty after the item has been received by the customer. For any extended warranty services covered under the Program, please log onto our website to complete the RMA request form online. The request form will allow you to request for replacement parts. If you have any questions regarding the RMA process, please submit a technical support ticket here. When returning product, please be sure to enclose a clear description of the problem and your proof of purchase with the defective product and return it as instructed by the Cooler Master RMA Department. Be sure to package the product securely (preferably in its original packaging) and ship it postpaid. Your dealer or Cooler Master will not be responsible for damage due to shipping. During the warranty period, your product will be repaired or replaced without charge, excluding shipping and handling. 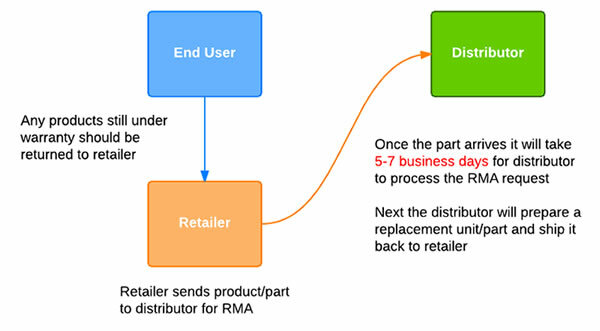 If your product needs to be returned within the warranty period, please do so through the retailer or distributor from whom you purchased the product. Within the first 2 years after purchase, please return your product (or for power supplies installed within our enclosures, just the failed power supply) to your dealer or reseller for a replacement. If the product is still within warranty and you can no longer return it to your dealer, please contact Cooler Master Customer Support for assistance and instructions. Cooler Master will not accept returns without prior approval and an RMA number. When returning product, please be sure to enclose a clear description of the problem and your proof of purchase with the defective product and return it as instructed by Cooler Master. Be sure to package the product securely (preferably in its original packaging) and ship it postpaid. Your dealer or Cooler Master will not be responsible for damage due to shipping. During the warranty period, your product will be repaired or replaced without charge, excluding shipping and handling.